The interiors of this London hotel, designed by New York firm Grzywinski + Pons, are intended to bridge the gap between home and hotel stay. 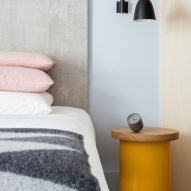 The firm used a palette of muted and pastel colours for each of the 168 rooms in the Leman Locke hotel, located in the East London area of Aldgate. Grzywinski + Pons designed much of the furniture and lighting itself, in an aim to create a boutique-style hotel that could serve as a home for nomadic creative workers on extended stays. 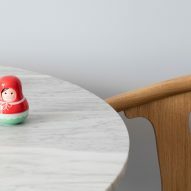 "Our process was driven by the search for a way to hold onto the aspirational excitement of a hotel stay while enjoying the advantages of something more akin to a home in one's adoptive city no matter how long – or short – the stay," said the firm. L-shaped sofas in pale pink offer room to lounge, and side tables are topped in marble or made from wood. Visitors can store belongings in bespoke shelving. 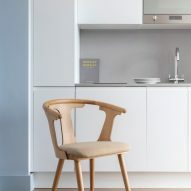 Rooms in the Leman Locke hotel were finished with wooden flooring and blue and white walls – with some areas left as bare concrete – and minimal kitchen units were installed in the building's 63 larger suites. 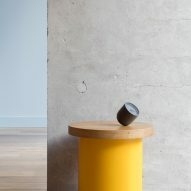 Lighting includes cantilevered floor lamps made from contrasting wood and metal elements, and minimal bedside wall lights. "We wanted to avoid the 'transformer' vibe apparent in a lot of current micro-residential products that include murphy beds, retractable desks and flip-up tables," said Grzywinski + Pons. 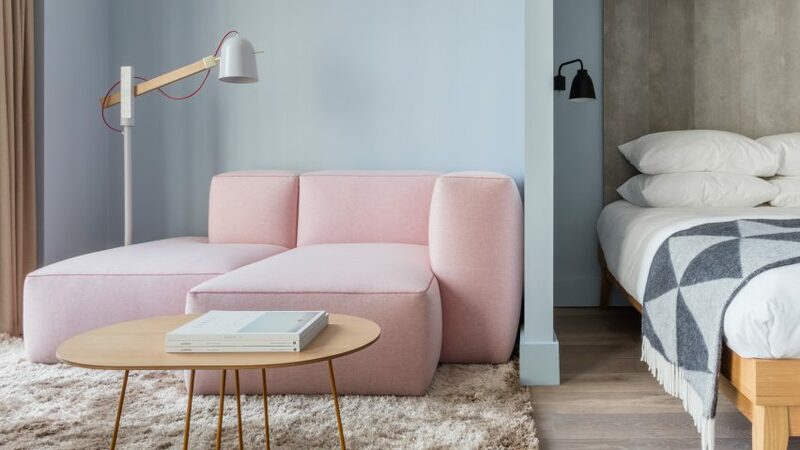 The studio previously paired industrial fittings and a pastel palette for another London hotel. It also blended Italian, American and Danish design to create a "mash-up" interior for a hotel in Queens, New York. 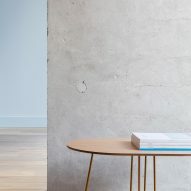 Elsewhere in the hotel, the firm divided the reception and cafe space, separating them with the lift lobby but creating similar "light, warmth and texture" to link the two. Photography is by Nicholas Worley.